The Land Before Time was a wonderful Don Bluth film from 1988. In the original film, a group of dinosaurs leave their homes for the Great Valley, a place of promise and opportunity. Along the way, a sauropod ("Long Neck") named Littlefoot becomes separated from his group and watches his mother die to protect him from a Tyrannosaurus Rex ("Sharptooth"). Littlefoot meets up with other young dinosaurs of different species as they try to get back to their families. Epic Questing ensues, and good times are had by all. The first film, made during The Renaissance Age of Animation, is well remembered for its excellent character animation (a hallmark of Don Bluth films), surprisingly complex plotting, and amazing soundtrack by James Horner. It was the highest-grossing animated film ever at the time it came out, though it didn't hold this distinction for too long. The film contracted Sequelitis in 1994. The many, many, many sequels were created without any input from Don Bluth. They have a drastically Lighter and Softer tone (complete with musical numbers and cheap animation, though it improved with the shift from traditional to computer animation), and... well, to put it bluntly, they weren't received well by fans of the original film. Some viewers count the sequels as Guilty Pleasures; oddly, most fans of the Lighter and Softer sequels might get quite frightened by the original movie. The biggest point of contention about the sequels, in all fairness, is the fact that there are thirteen of them, as well as a TV series (which ran from 2007 to 2008). When Universal Studios finally pulled the plug on its animation studio however, the franchise was thought to finally be extinct, but a new Direct to Video movie was released in 2016. Time will tell if the franchise will stay revived. Time to teach the kids Roman numerals! The character sheet is here (work in progress). Acrophobic Bird: Petrie the Acrophobic Pterosaur'. Adaptational Villainy: Sharptooth was merely Ambiguously Evil in the movie. The novelization makes him a prehistoric Serial Killer. Award Bait Song: "If We Hold On Together". Berserk Button: Aside from the bout of depression he experiences in the first part of the film, the only time the normally level-headed Littlefoot loses it is when Cera insults his mother. Big Shadow, Little Creature: Played for Drama in the first film, when Littlefoot mistakes his own shadow for his mother's. Blatant Lies: Cera tells her own version of her encounter with Sharptooth in the underground to the group. A version where she attacked Sharptooth when he was awake and hunting for her. Of course, what actually happened, is that she did the triceratops equivalent of poking a dead body. As soon as it turned out he was alive (and awake), she ran off terrified out of her mind like anyone would expect. Of course, her lie was so damn blatant to Littlefoot, that he disbelieved all of her story, including the part where Sharptooth survived. Crapsack World: The world outside the great valley is extremely forbidding, stark, lonely and dangerous. Disney Death: Petrie when it looks like he was crushed under the same boulder used to kill sharptooth. Just when they're about to walk off in tears, Petrie comes back. Disney Villain Death: Sharptooth, who gets crushed under a boulder and drowns. Earn Your Happy Ending: Taken to levels all but unheard of in an animated film. 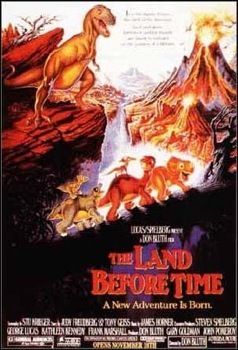 First, the massive earthquake early in the film which kills many dinosaurs (including Littlefoot's Mother) and separates Cera from her parents, Littlefoot going through a massive state of depression when coping with his mother's death, the entire group facing massive bouts of starvation, the ever looming threat of the sharptooth, and Littlefoot trying to keep everyone together while trying to find the Great Valley. Fortunately, they do find it, and get their families (or, in Littlefoot's case, his grandparents) back as icing on the cake. Eldritch Abomination: The Tar Monster that seems like it's going to eat Cera only to be revealed that it's just Littlefoot and the others stuck together with tar. Eye Awaken: The scene where Cera charges at Sharptooth's face, only to have Sharptooth's menacing eye open and stare at her. Family-Unfriendly Death: The death of Sharptooth. Littlefoot's mother's death. You can see the sharptooth tearing at her back in the shadow, and even her wound as she continues to fight. Originally, this was shown full-on, but it was so scary that it was re-done so it was seen only in the shadow. Fantastic Racism: Between the dinosaur species. At one point Cera refers to Littlefoot as a "flat head" after hearing her father do the same. It's really obvious that Cera's father is a Fantastic Racist in general. Sixth Ranger: Chomper (sequel films) and Ruby (TV series). Growling Gut: Happens to Ducky just before Petrie makes his first appearance. Hate Sink: Sharptooth, and in some ways, Cera for most of the movie as well. Herbivores Are Friendly: The main characters are heroic herbivores (except for Petrie -- pterosaurs ate fish). Human Ladder: The Five-Man Band does this a couple times in the movie (except for Cera). Jerk with a Heart of Gold: Cera. Late Arrival Spoiler: Want to know if they made it to the great valley or not? Don't watch the sequels, then. Nice Job Fixing It, Villain: It's the Sharptooth's breath shooting up from its nose that gives Petrie the added push he needed, so that he can learn to fly. He then becomes instrumental in distracting the Sharptooth so the others can push the boulder down on it. Parental Abandonment: Par for the course, as it's a Don Bluth film. Prehistoria: Creatures portrayed come from Permian Dimetrodon to Cretaceous T-rexes, and then there is the volcano/tar pit thing. The Promised Land: The Great Valley. Played on the idealistic side. Real Is Brown: The best known animated feature to apply this trope. It is to the point where no two promotional items agreed exactly what Petrie's real color scheme was. Reality Subtext: Many viewers are devastated and horrified when they find out that Judith Barsi, the voice of Ducky, was murdered by her own father in 1988. Ridiculously Cute Critter: Each of the main cast. If you don't think they are cute you may not have a pulse. Roaring Rampage of Revenge: The novel version of the film shows that the reason why Sharptooth is so hellbent on killing the kids is because, when Littlefoot and Cera tried to escape from him, the thorns cut Sharptooth's eye. Slasher Smile: Cera grins pretty mischievously when she discovers the Sharptooth's (not quite dead) corpse, when deciding to use him as ramming practice. The way she licks her lips when she catches up to that beetle she was chasing at the beginning also deserves mention. Shown Their Work: For the time, and remember it was twenty-odd years ago and the complete remains of some of the featured species (especially Tyrannosaurus) hadn't been found yet, this was the most accurate dinosaur movie ever made (ignoring the Talking Animal issue of course). Even today, the care put into the film is impressive. Somewhere a Paleontologist Is Crying: While the opening narration gets "Before the mammoth and the mastodon" right, that's basically the extent of accuracy in this regard. While most of the species in the film are from the Late Cretaceous of North America, Littlefoot (an Apatosaurus) and Spike (a Stegosaurus) are both Jurassic. While Littlefoot and family could be Alamosaurus, a sauropod from the proper time and place, there's no excuse for Spike's appearance. Plus, an even older Dimetrodon is encountered halfway through the film. Strange Syntax Speaker: Ducky and Petrie. Stock Dinosaurs: An Apatosaurus for the obligatory sauropod (more anatomically accurate than most other movie "brontos" (note the non-aquaticness and raised tails! ), but still called Brontosaurus in releases), Triceratops, Pteranodon, Stegosaurus, and Tyrannosaurus all play major roles in the film. And then we have the mammal-relative Dimetrodon with a snake-tongue. There are some aversions though: the hadrosaurs belong to the relatively obscure Saurolophus (Parasaurolophus according to the producers); the armoured dinosaur Rooter is an old-fashioned Euoplocephalus and not the usual Ankylosaurus; and this is perhaps the first time that the bone-headed Pachycephalosaurus appeared in a notable popular work, portrayed as a vicious pack of racist bullies. The only stock dinosaur from the today Five Man Band which is missing is Velociraptor, but only because the film is older than Jurassic Park (surprisingly, raptors do appear in the first sequel made after Spielberg's film). Spinosaurus and Liopleurodon also appeared in films made after Jurassic Park III and Walking with Dinosaurs, respectively. Super-Persistent Predator: Sharptooth is actually behaving exactly how a predator behaves in this dire situation. In the lack of significant food sources, a lone predator will often pursue individual targets for several days until he either finds easier food elsewhere, or is injured or killed. And a group of infants without a herd to protect them, in real life, would be an extremely easy meal. Luckily, our protagonists are smarter than their real life counterparts. True Companions: "There had never been such a herd before." and the original final line "We'll always be together." Verbal Tic: Ducky. Yup, yup, yup. The words were actually placed on Judith Barsi's gravestone (see Reality Subtext). Unspoken Plan Guarantee: Pretty much averted; the plan doesn't go quite as seamlessly as expected but still works even though Little Foot explained it all in detail. Unusual Animal Alliance: The narrator points out that the world 'has never seen a herd like this before'. Viewers are Morons: The narrator says some pretty obvious stuff. Though this may be because the original idea was that it would have just a narrator and no dialogue. Why Are You Looking At Me Like That? : Littlefoot uses Ducky as Sharptooth bait. The Window or the Stairs: Cera and the other dinosaurs refuse to follow Littlefoot's instructions on where to go to find the Great Valley, instead taking an easier path. Their "easier path" winds up trapping them all in a deadly lava flow. Yank the Dog's Chain: When Petrie tries to join Littlefoot after the others go with Cera, but is unable to follow solely because of how unstable the surface he's climbing on is. And he can't fly. Actor Allusion: Rinkus, Pterano's Bumbling Sidekick with the cockney accent, is pink. Guess, just guess who voices him. In Journey Through the Mists, all the adult dinosaurs are concerned about the health of Littlefoot's grandpa, but none are brave enough to risk personal safety to find the flowers that have the cure. To clarify, the old one does say "There is safety in numbers", yet doesn't act on it in terms of retrieving the flower. Possibly lampshaded in The Stone of Cold Fire, when Grandma Longneck states that the children have gone off on their own, and Ducky's mother comments "Of course they did! They saw us all just standing around arguing here..!" Alien Among Us: The Rainbow Faces pair in the seventh movie. No, this is real. This is what The Land Before Time is now. All Animals Are Dogs: In the second movie, Chomper licks Littlefoot's face on more than one occasion. It also becomes a staple personality trait of Spike. Big Shadow, Little Creature: Chomper in the fifth movie. Also in the second movie, in fact, this actually saved his friends from Ozzy and Strut. They eventually wised up, although by that point they were too late as Chomper's parents were still in the Great Valley. Conspicuous CG: From Movie VI on, particularly in X: The Great Longneck Migration, as Marz Gurl points out. Most likely due to the fact that Wang Film Productions had a sister company that specialized in CG (Sony Imageworks did the CG for film VI however). Continuity Drift: In the original film, Ducky was designated as a Bigmouth. In the sequels, she was instead called a Swimmer. Convection, Schmonvection: The animated series episode "The Canyon of Shiny Stones" is made of this trope (although they do, at least, remember that volcanoes produce choking smoke). In VII Littlefoot and his friends escape the storm by entering the base of a volcano. What's worse is that they actually SLEEP in said volcano, and then get on a makeshift elevator that gets them to the top when the volcano erupts! Daddy Had a Good Reason For Abandoning You: Depending on your definition of good. Bron did explain himself, and initially he was powerless, but that's as good as his excuse is. Department of Redundancy Department: From XII: "Many changes had occurred on this day of changes." Dirty Coward: Subverted. It seems that Rinkus is this but it's revealed he just played on long Pterano's plans for his own ambitions. Dude Looks Like a Lady: People's first reaction to finding out Tippy from VIII is male was "So many Fan Fics suddenly got much, much gayer." Evil Uncle: Petrie's Uncle Pterano in The Stone of Cold Fire complete with eyebags, long fingers, and an English Accent. Except for the killing bit, but he does kidnap Ducky... and then saves her in the end, so he's not totally evil. He's got his regrets. Even Evil Has Standards: Pterano, see above. Everything's Even Worse with Sharks: The shark in Part V.
Littlefoot mourns for his mom a good deal of the first film, but only mentions her a grand total of three times during the following twelve sequels, one of which is just a passing reference. Presumably the writers were uncomfortable about bringing up such a dark topic in a kid's series. Notable is the song "Always There" from The Land Before Time V. Littlefoot even quotes from her. She also got a big mention in The Great Longneck Migration. Incredibly Lame Pun: When they arrive at the Great Valley after a long trek, one of the egg-stealing dinos in the second film says that he's just "egg-xausted". His partner kicks him in the face in response. I Never Told You My Name: How did anybody ever find out Pat's name in The Great Longneck Migration? He never told it to anybody himself. Informed Ability: Red Claw is stated to be the biggest and most dangerous Sharptooth around. Considering his accomplishments so far, including retreating from having fruit thrown at him, as well as the tone of the TV series, that is a status he will never live up to. Some fans believe Red Claw is the original Sharptooth, somehow survived and given a scar from the boulder and dunking. If that was true, oh how the mighty have fallen. There's also the "biggest, meanest, most ferocious Sharptooth ever" from Secret of Saurus Rock, who showed his big mean ferocity by getting whipped (literally) by Doc. Large Ham: Pterano, all the way! You can really tell Michael York had a great time voicing him. Lighter and Softer: There are times when this trope works, and then there's this. My Species Doth Protest Too Much: Chomper (see Carnivore Confusion above). Never Trust a Trailer: The promo for The Land Before Time II makes you think the Sharptooth in the sequel is the Sharptooth from the original film. Off-Model: an unfortunate side effect from outsourcing to South Korea and Taiwan. Papa Wolf / Mama Bear: The parents of the five main characters, but also Chomper's parents. Notably, they were willing to enter the Great Valley to search for their child (whom Littlefoot and his friends accidentially brought in when trying to rescue another egg that Ozzy and Strut stole), and when they saw Chomper in danger, they made absolute certain that whoever harmed them paid in full, even doing so to members of their own kind. Putting a Hand Over His Mouth: The egg-stealers do this to Littlefoot in the first sequel, briefly. Recycled: the Series: It was bound to happen eventually. Shown Their Work: Sure they may not be living in the right place or the right time, but the variety (and obscurity) of some of the dinosaurs featured is quite astounding. It may be the most redeeming feature of the sequels. Suddenly Voiced: Spike in an episode of the TV series. Well, it's not so much actual talking as it is us hearing what he's thinking. And it only lasts for the one episode. In an earlier sequel, he yells Ducky's name... then never speaks again. He shouted "Mama!" (his adopted mother) in the Big Freeze after falling into the ice water. That Reminds Me of a Song: Part of the sequels' Lighter and Softer nature. Though most of the segues into songs are rather well done for children's movies, and at least they make the songs fit in with the story. Except for that bit in "Journey To Big Water" when Ducky comments that they should sing to pass the time. Cue rendition of a song from a previous film. The Starscream: Pterano's two lackies, Sierra and Rinkus, decide that Pterano has much too high of an opinion of himself and they don't like his more moral goals, so they intend to take the Stone of Cold Fire for themselves. True Companions: "We're a family and you're one of us now!" If that isn't a True Companions song, then nothing is. Villain Song: "Eggs" in the second, "When You're Big" and "Tough" in the third, "Who Needs You?" in the fourth and "Very Important Creature" in the seventh (Though "Very Important Creature" is more about how the villain sees himself as right and not a villain at all). Vocal Dissonance: Spike finally talks in IV...but he sounds like the Aflac Duck. Mercifully, he goes back to not talking at all aside from the occasional grunt. ↑ Or they could have learned them from an insanely popular series. This page was last edited on 12 September 2017, at 20:51.